Bose announced its first pair of Sleepbuds late last year on the crowdfunding service Indiegogo. Now, half a year later, you can buy yourself a better night's sleep. Currently only available in the US and Canada, the Bose Sleepbuds are designed to sit in your ear comfortably while you roll around in your sleep. The Sleepbuds use noise-masking tech to block out the sounds around you, ensuring you don't keep waking up at the slightest sound – or, most importantly, your partner's snoring. 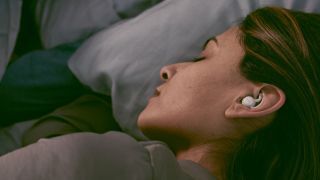 Sleepbuds also offer white noise tracks such as wind turbines or waves to help you drift off at night, so you won't just be listening to total silence when you're about to sleep. Bear in mind though the Bose Sleepbuds cannot play music: they're purely designed to help you sleep better at night. They use Bluetooth to connect to your phone so you can select your white noise sounds and preferences, plus there's a charging case for when they run out of battery. Bose reckons the Sleepbuds will last for 16 hours, and we'll be sure to test that claim in our upcoming review. Right now you'll need to live in the US or Canada to be able to buy them: it's $249 for the pair. If you'd previously backed the Indiegogo campaign you would have got them for a lower price, but now you'll have to pay extra. Bose has said the Sleepbuds will be coming to other markets including Europe, Asia-Pacific, Mexico and Latin America in the coming months too, so hopefully you'll be able to buy them elsewhere before the end of the year.